Located in south central Oregon, Crater Lake National Park is the state’s only national park and is famous for its amazingly clear water and beautiful blue color. This deep cauldron-like volcanic lake was formed when Mount Mazama collapsed in a volcanic eruption thousands of years ago. The eruption also formed a cinder cone, now called Wizard Island, which is at the lake’s western end. Wizard Island’s highest point is almost seven thousand feet above sea level and seven hundred fifty five feet above the lake’s surface. It contains over three hundred acres of land area, with a volcanic crater at the top that is five hundred feet wide with a depth of one hundred feet. 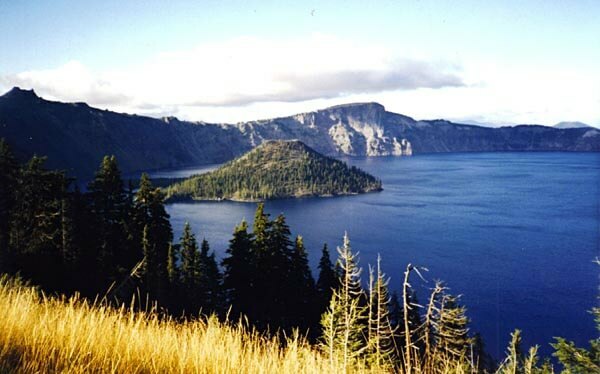 Wizard Island is available for visitors to access during the summer months when boat tours of Crater Lake are operating. Departing from Cleetwood Cove at the lake’s northern end, the boats circle the lake and take passengers to the south side of Wizard Island where there is a dock at Governors Bay. If boat passengers disembark on Wizard Island from the earlier boat tours during the day, they may have to spend the day there unless there is room for them to on the ensuing boats. Boat tours later in the day do not disembark passengers on the island. At the end of each day one final boat arrives to pick up any visitors still there. No one is allowed to stay on the island overnight. There are two trails for hiking on Wizard Island. One goes back and forth up the cone and around the top of the crater and the other goes from the dock toward the island’s western edge. One hundred species of plants cover the island. Some of the trees date back eight hundred years. Hemlocks and Shasta red firs cover the island’s lower parts. White bark pines, manzanitas and wildflowers cover the upper parts. The unique setting of the volcanic crater’s deep blue lake with the Wizard Island cone in it is an attraction that is quite memorable, especially since the volcanic cone is considered one of the most spectacular in the world. Last updated by Ginny on 04 March, 2012 in Destinations.